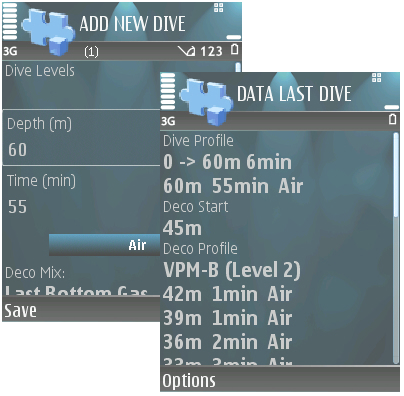 JDeco is the first and only dive decompression program that is available for JAVA enabled mobile phones and PDAs. It utilizes the Varying Permeability Model (VPM-B) and Bühlmann's decompression algorithm with Erik Baker's Gradient Factors for mixed gas decompression in open-circuit (OC) and closed-circuit (CCR) diving mode. On a dive boat or on any other dive trip you try to minimize the stuff you have to carry along. Your mobile phone, however, will always be with you. With JDeco you can give your phone an additional use - you can use it to plan your dives! Additionally you can use it to calculate your gas mixings. Now you can leave your notebook (or desktop PC ;)) at home. DISCLAIMER I (the author) of JDeco do not guarantee that the program is free of errors. Furthermore, I do not warrant that the implementations of the Bühlmann algorithm, the VPM-B algorithm and the gas mixing tools in JDeco are correct. The profiles generated by JDeco and any other dive decompression software will not guarantee that you will not get bend or even die. By downloading, installing, and using any version of JDeco you agree that you use all results, generated with JDeco on your own risk, and that I, the author, of JDeco can not, under any circumstances, be made liable for your use of the program and any kind of injuries that any person might get as a result.